I’ve always thought it was weird to sit next to someone on a plane and not say hello. I don’t mean a long chat, “Where are you going? Do you live there? What do you do for work,” merely a hello. Or to pass someone on the street or at the gym who pretends not to see me. It’s downright weird. And it’s even worse at work. Passing someone in the hallway at work who you may or may not know and not saying hello can be off putting to many people. Admittedly, some people don’t care. But more do. Chances are you’re not thinking any of these things about the people you work with. You’re busy and focused on other things, and your mind is not on making small talk when you pass people in the hallway. But know that not saying hello can have an impact on the people around you and your corporate culture. 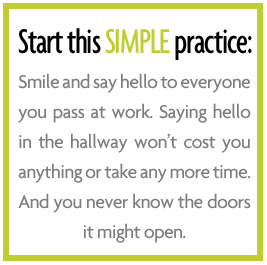 Start this simple practice: Smile and say hello to everyone you pass at work. Saying hello in the hallway won’t cost you anything or take any more time. And you never know the doors it might open. Maybe the person in accounts payable who’s been kicking back your expense reports will cut you a reimbursement check even when you fill out the wrong form. Or maybe IT will come to your desk first versus eighth when your laptop decides it’s taking a vacation day. Get more simple ways to strengthen your corporate culture with a signed copy of How to Say Anything to Anyone. The book is on sale for $15 to celebrate our 4th printing. It’s the perfect holiday gift. Get your copy now! Offer ends 12/31/16.